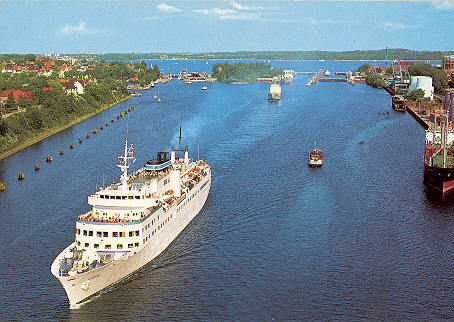 This page is devoted to postcards and photographs of the Finland Steamship Co ferry Ilmatar. 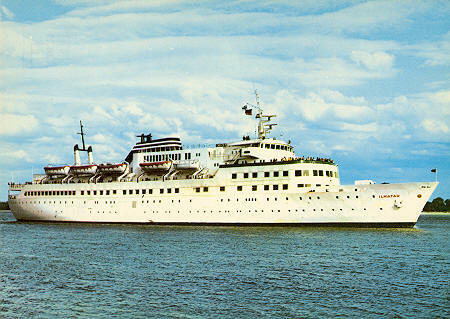 Ilmatar was the first motor passenger ship for the Finland Steamship Co. She was delivered from Wärtsila of Helsinki in 1964, and operated on routes from Stockholm to Turku or Helsinki. Ilmatar was initially powered by a single 4500bhp Sulzer engine, giving a leisurely speed of 16.5 knots. She was 5171grt, and 108m long. In 1973, Ilmatar was rebuilt in Hamburg, increasing in size to 7355grt and 128m long. Two additional Nohab wing diesels were added, increasing speed to 19 knots. She was then used on the Helsinki-Trävemünde route. 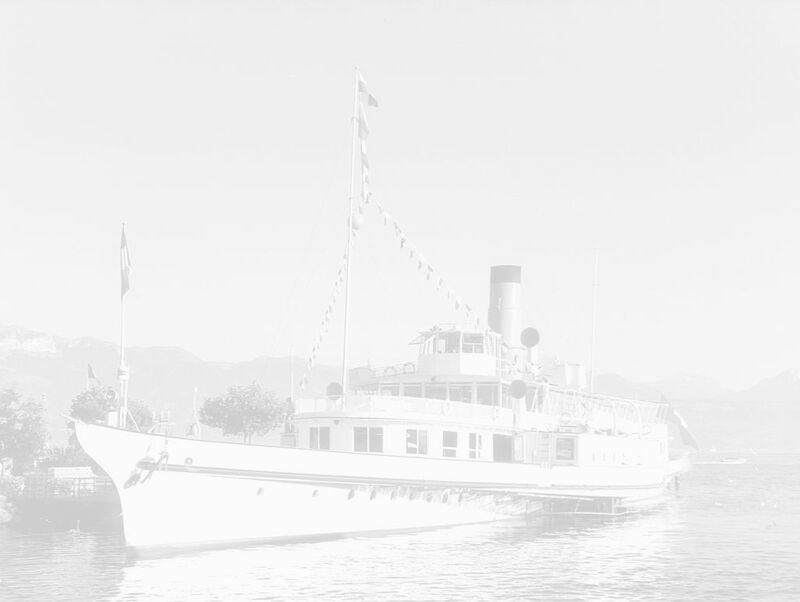 She was later used on cruises in the Baltic, Mediterranean and along the Norwegian coast. 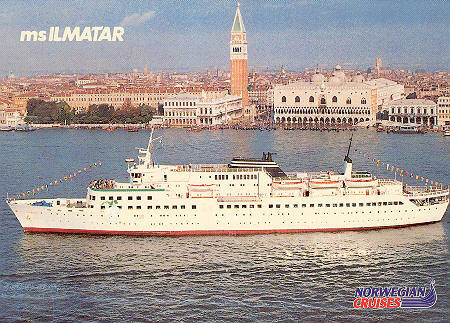 In 1979 Ilmatar was refitted as a Mediterranean cruise ship by her builders Wärtsila. 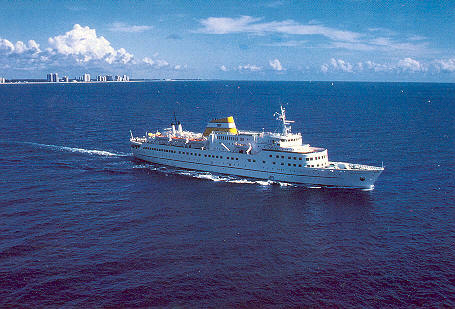 In 1980, she was sold to Vesteraalens Steamship Co of Norway and continued cruising under the Norwegian Cruises banner without change of name. She later received Vesteraalens funnel colours. She was reportedly renamed Viking Prince in 1982, but was laid up in Toulon and offered for sail. In 1984 she was bought by Crown Cruise Line, renamed Viking Princess and operated out of Palm Beach, Florida on cruises to the Bahamas. From 1997, she was renamed Palm Beach Princess, operating on the same route for Palm Beach Cruises. 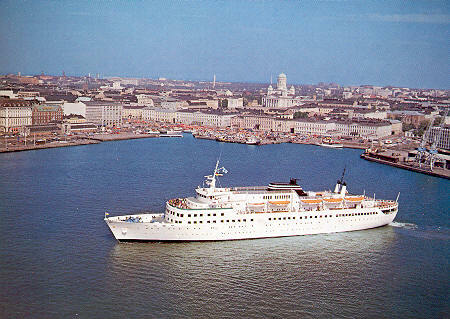 Ilmatar was the first motor passenger ship for the Finland Steamship Co. She was delivered from Wärtsila of Helsinki in 1964, and was the largest passenger ship they had built up to that time. Ilmatar operated on routes from Stockholm to Turku or Helsinki. Ilmatar was initially powered by a single 4500bhp Sulzer-designed engine, giving a leisurely speed of 16.5 knots through a single screw. She was 5171grt, and 108m long. Her passenger facilities consisted of 110 berths in first class, 222 in second, and up to 1068 unberthed. Ilmatar could carry 50 cars through side doors. The progress in car fery design was such that an order was placed for a much larger ship, the Finlandia, even before Ilmatar was delivered. She was used for occasional cruising from the time she was built. Official Finland SS Co postcard of Ilmatar as built. 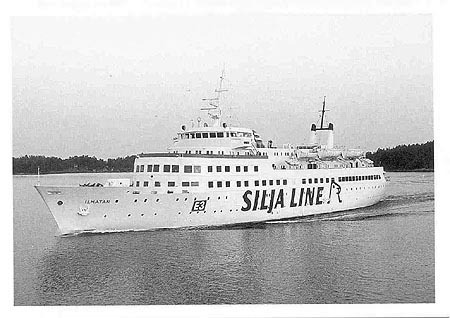 Finland SS became part of the Silja Line consortium, and Ilmatar is shown here with their hull logo. Postcard of Ilmatar as built, with large hull logo. In 1973, Ilmatar was rebuilt in Hamburg, increasing in size to 7355grt and 128m long. Two additional Nohab wing diesels were added, each with their own screw, increasing speed to 19 knots through three propellors. She was then used on the Helsinki-Trävemünde route, which was jointly run with Finnlines. The rebuild also improved facilities for use on cruises in the Baltic, Mediterranean, Atlantic Islands and along the Norwegian coast. She now had berths for 450 passengers, but car capacity was unchanged. 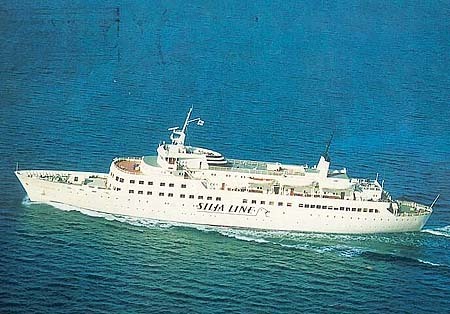 In 1975, Finland SS withdrew from the joint Trävemünde service, but Ilmatar remained on the route for that summer on charter to Finnlines. 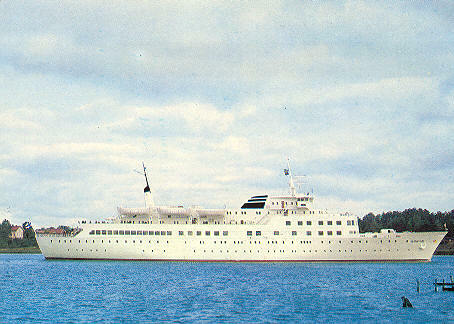 She was then used mainly on cruising, and received another refit in early 1979 to further improve facilities, including swimming pool, casino, gym and a cinema. 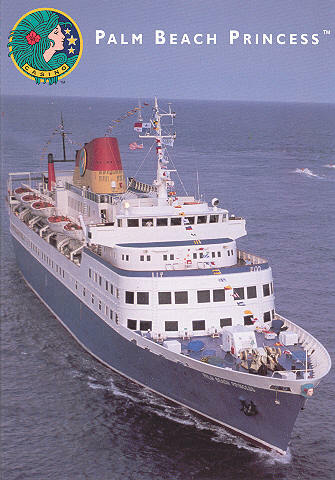 One presumes she was not a great succes, since she was sold to Vesteraalens SS Co in October 1980. Official Finland SS Co postcard of Ilmatar as rebuilt. 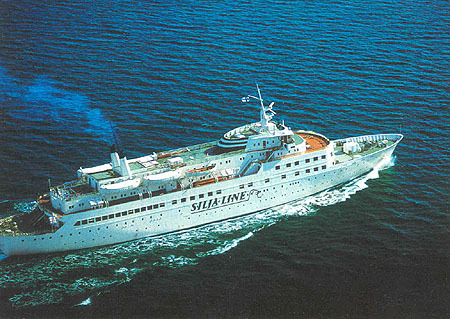 She lost the Silja Line logo when moved to cruising. Postcard of Ilmatar as rebuilt. Photographic postcard of Ilmatar as rebuilt. 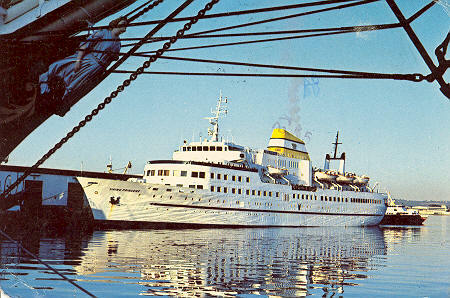 In early 1979, Finland SS Co had Ilmatar refitted as a Mediterranean cruise ship by her builders Wärtsila. 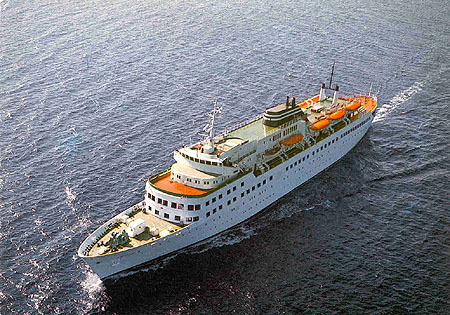 In October 1980, she was sold to Vesteraalens Steamship Co of Norway and continued cruising under the Norwegian Cruises banner without change of name. She later received Vesteraalens funnel colours. This was also not successful, the winter 1982 programme was cancelled, and Ilmatar was laid up in Toulon and offered for sail. She was reportedly renamed Viking Prince at this time, but remained in lay-up for two years. 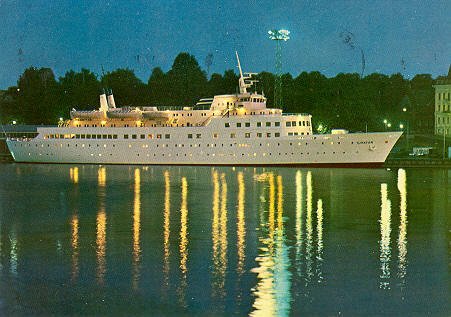 Official Vesteraalens/Norwegian Cruises postcard of Ilmatar, still in Finland SS colours. Verlag Mielck postcard 7609, showing Ilmatar in the Kiel canal in Vesteraalens colours. 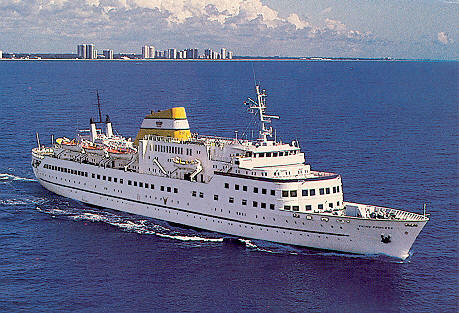 In 1979 Ilmatar was refitted as a Mediterranean cruise ship by her builders Wärtsila. 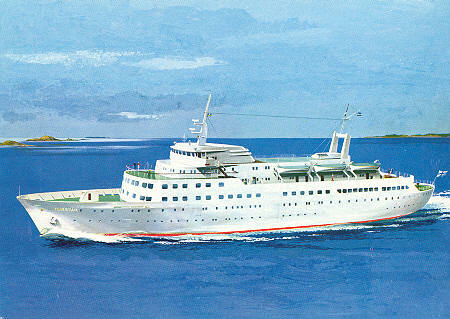 In 1980, she was sold to Vesteraalens Steamship Co of Norway and continued cruising under the Norwegian Cruises banner without change of name. She later received Vesteraalens funnel colours. She was reportedly renamed Viking Prince in 1982, but was laid up in Toulon and offered for sail. In 1984 Ilmatar was bought by Crown Cruise Line, renamed Viking Princess and operated out of Palm Beach, Florida on cruises to the Bahamas. 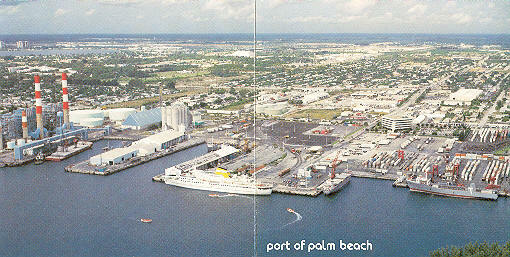 From 1997, she was renamed Palm Beach Princess, operating on the same route for Palm Beach Cruises. Initially at least, this was under the same ownership as Crown Cruise Line. 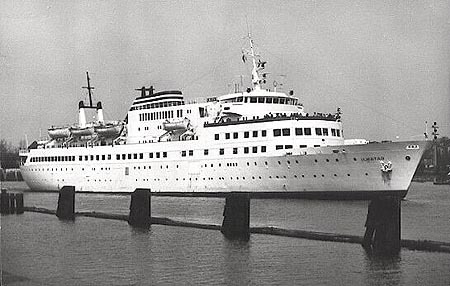 Crown had moved up market with new ship deliveries, and they wanted to distance their operations from the gambling market that Viking Princess operated. 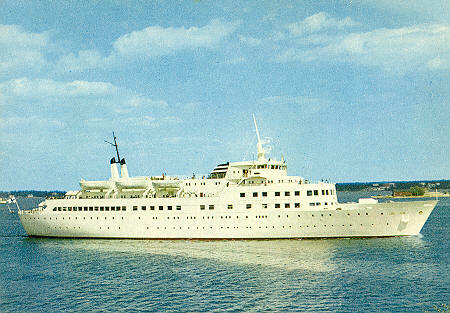 Official postcard of Viking Princess. 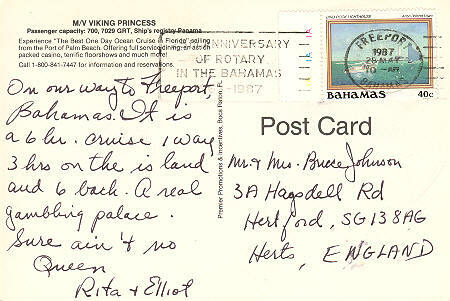 A Port of Palm Beach greetings card, with Viking Princess alongside. In 1984 Ilmatar was bought by Crown Cruise Line, renamed Viking Princess and operated out of Palm Beach, Florida on cruises to the Bahamas. From 1997, she was renamed Palm Beach Princess, operating on the same route for Palm Beach Cruises. 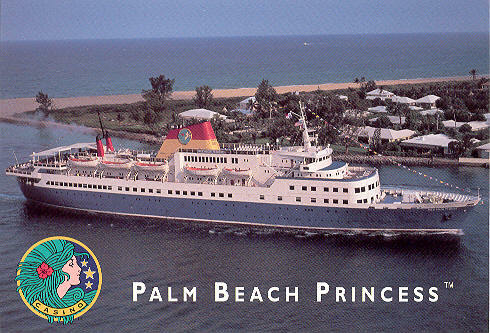 Official postcard of Palm Beach Princess. Brochure for Palm Beach Princess.